I don’t like to use the term “make-do” to describe antiques with inventive repairs, as I feel it diminishes the artistry and integrity of the piece. 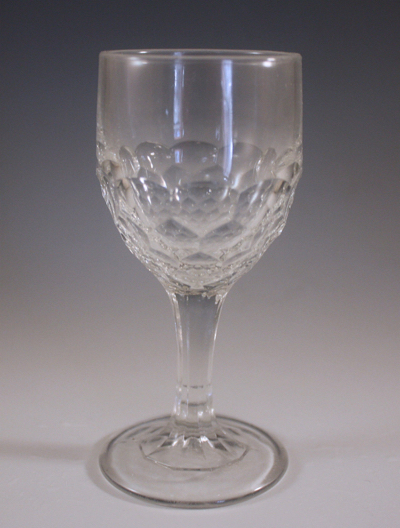 But this EAPG (Early American Pattern Glass) 5-1/2″ tall goblet in the Honeycomb pattern is a make-do in the best sense of the word, a fine example of Yankee ingenuity. Made in America between 1850-1870 during the Industrial Revolution, machine-made pressed glass examples such as this were mass produced and available to all. 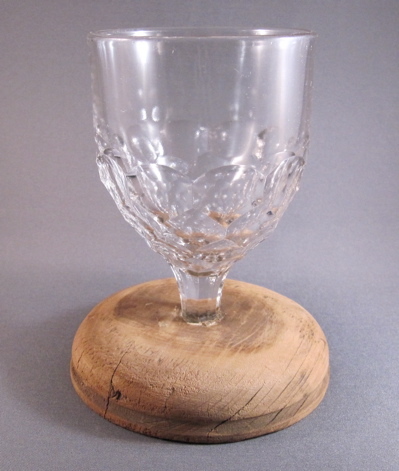 Though more affordable than hand blown glass counterparts, this goblet was still cherished enough by its owner to be repaired after it broke. 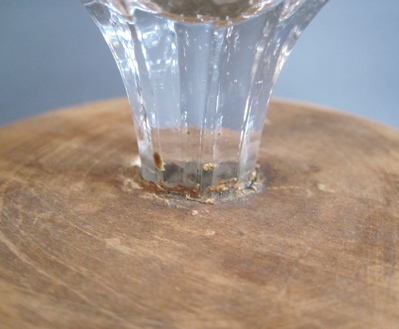 In this case, after the base snapped off, a simple unpainted and overscaled wooden base was attached to what was left of the broken stem. 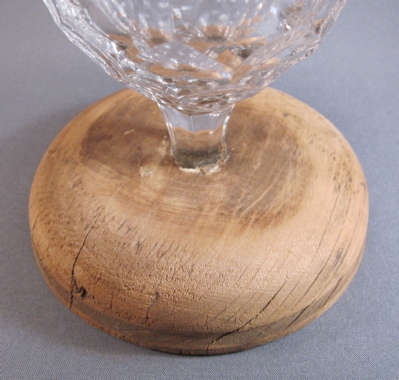 The result is a bit comical, as we are left with a short, stout goblet with an extra wide wood base that resembles half of a yo-yo. 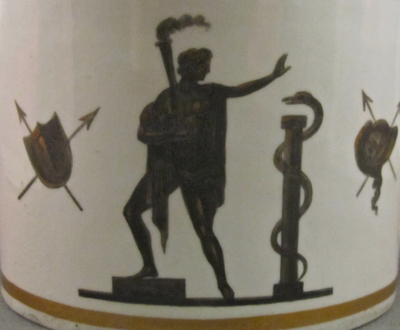 This example with its original base shows what my goblet looked like before it took a tumble. Most people I encounter are astonished the first time they see broken ceramics held together with staples. I was, too, at a young age when I saw a small stapled dish. The first words uttered are typically “how did they do that?” If you type that very question into my search box on this page, a post from a few years ago will pop up and help answer that much asked question. 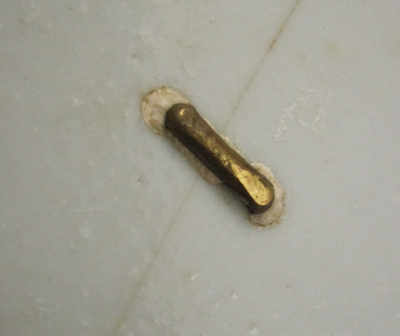 Sadly, most pieces repaired with staples, aka rivets, are not signed by the menders so we have no idea who repaired them. I have seen 18th century English and American newspaper advertisements and calling cards from tinkers and jewelers offering their repair services, as well as early prints showing “china menders” with their tools. 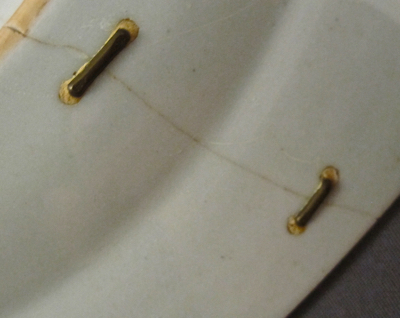 Today, antique ceramics with staple repairs are not uncommon but many rare examples are quickly disappearing, as restorers will carefully remove staples, fill the holes and erase all evidence of the original “honest” repair. 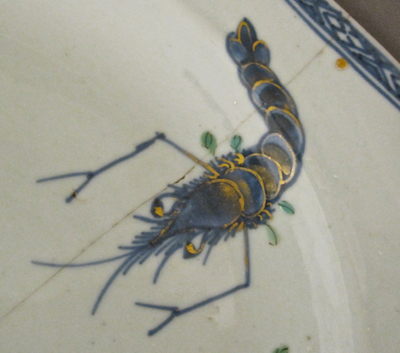 Although I have dozens of examples of early staple repair on a variety of forms, I still get a thrill when I encounter a rare or unusual example untouched by a modern restorer. 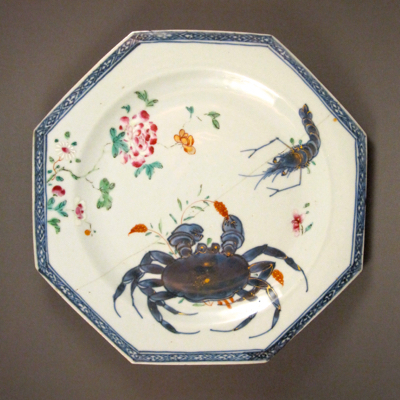 This porcelain plate was made in Jingdezhen, China, during the Qing dynasty (1740-1760) and measures 8-1/2″ in diameter. 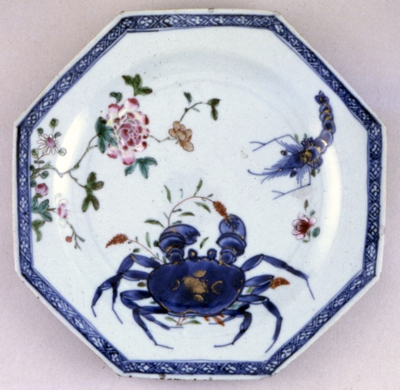 It is decorated in the Famille rose palette and features a large blue crab, crayfish, flowers, and a border with gilt detailing. Early in its life it was dropped, cleanly breaking it in half. 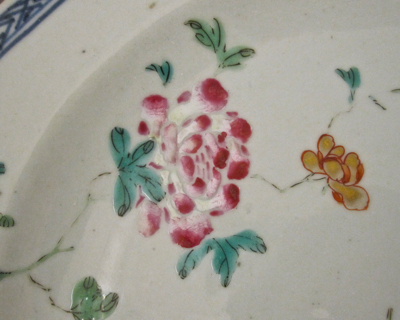 An experienced china mender reattached the plate using six small evenly spaced brass staples. 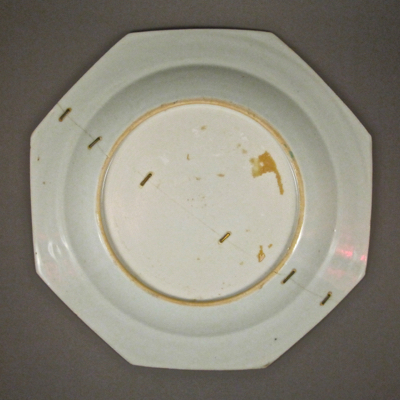 Repairs such as this are so tight and secure that the plate can be returned to the dinner table without fear of it coming undone. That is, unless another clumsy person lets it slip from his or her hands. 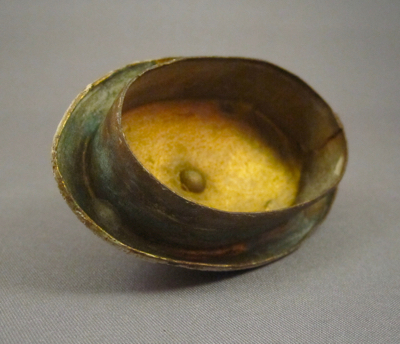 Another example, nearly identical to mine, is in the permanent collection of the British Museum. 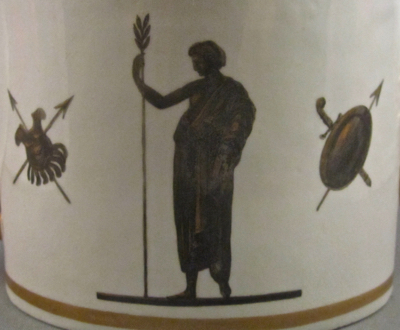 It was donated in the 19th century by Sir Augustus Wollaston Franks, described by Marjorie Caygill, historian of the British Museum, as “arguably the most important collector in the history of the British Museum, and one of the greatest collectors of his age”. 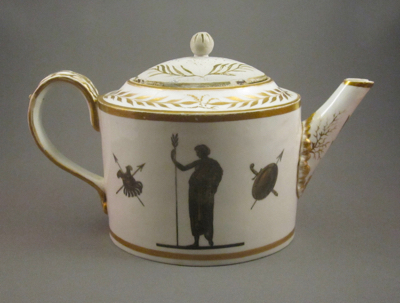 This striking oval porcelain teapot was made by Derby in England at the end of the 18th century and is decorated with neo-classic silhouette figures in black and gold as well as elaborately painted gilt decoration on the handle and spout. 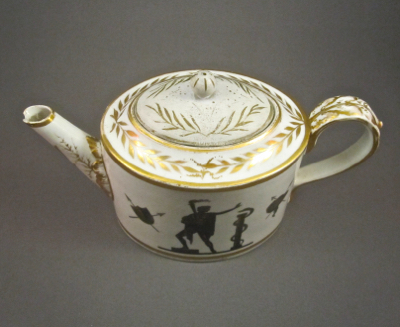 It stands 4-1/2″ tall and is 7-1/4″ wide from handle to spout and has a faint puce mark on the underside, dating it to around 1790. It is not uncommon for teapots to lose their original lids over the years and I suppose that’s what happened to this pretty pot. 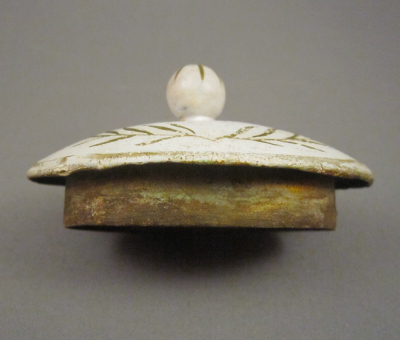 In this case, a tinsmith fashioned a well fitting replacement lid in the style of the original. 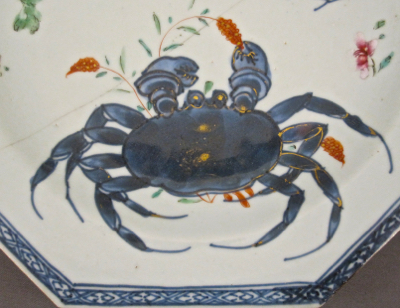 The raw metal was painted to match the original white body and gilt decoration was added. 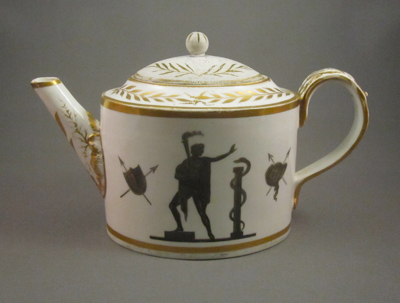 The resulting inventive repair is well done, hard to detect and allows the teapot to be used once again.